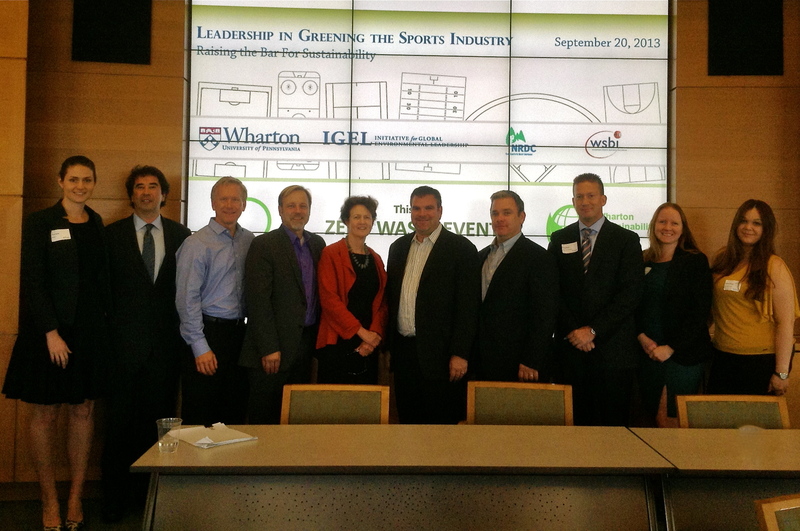 Last Friday, the Wharton Initiative for Global Environmental Leadership (Wharton IGEL) partnered with the Natural Resources Defense Council (NRDC) and the Wharton Sports Business Initiative to host representatives from the professional sports industry to share ideas around “Leadership in Greening the Sports Industry: Raising the Bar for Sustainability.” Allen Hershkowitz from NRDC, a senior scientist who is a thought leader in sustainability efforts in the sports industry, opened the panel with a remarkable statistic: 13% of people follow science, over 63% follow sports. The sports industry has a unique opportunity to influence trends in sustainability through its significant fan base across all types of sports. Additionally, the sports industry’s unique facilities and operations present significant opportunity for long-term cost savings through investments in environmental sustainability. This combination of financial incentives and a large base of loyal fans positions the sports industry for maximum impact on sustainability. Panelist Scott Jenkins has a history here in Philadelphia, as he was responsible for opening and managing Lincoln Financial Field, home of the Philadelphia Eagles, before beginning his current seven-year tenure as VP of Ballpark Operations for the Seattle Mariners. Jenkins has been a champion of greening the sports industry, and he currently chairs the Green Sports Alliance. Jenkins explained, when discussing his successful sustainability program at Safeco Field, that “money is the common thread” that runs through all successful programs. The return on sustainability investment has brought savings, sponsorship revenue, brand value, social responsibility and increased environmental performance. His colleague on the panel, Justin Zeulner, Senior Director of Sustainability & Public Affairs for the Portland Trailblazers, showed that these returns extend well outside the MLB to the NBA, by demonstrating the success of his programs at the Rose Garden Arena, home of the Trailblazers. Sports franchises everywhere track statistics feverishly and the team management can always recite the runs batted in or rebounds per game for key players. Until recently, many arenas were not applying the same analytical principles of sports statistics to the energy, waste, or water statistics of their operations. With tools such as energy efficiency or waste audits, stadium managers are able to analyze energy data in the same way a manager would analyze a batter’s swing or a guard’s foul shot. The most significant return on investment (ROI) was demonstrated in energy efficiency investments. In Seattle, Jenkins explained, retrofits and modifications have saved the franchise $2,173,211 on energy expenses over a seven-year period, for a total of a 25% cost reduction. If those savings were spread across the entire league, it is estimated that the MLB has the potential to save $16.5 million annually. In Portland, Zeulner led the effort that resulted in Rose Garden achieving the first LEED Gold certification in the NBA. The LEED EB O&M certification saved the Trailblazers $2.1 million since August 2011, which represents a stunning 467% return on investment. What about the fans? A dedicated fan usually prides himself/herself on the ability to name any statistic about his/her favorite player. But can a fan speak confidently about the stadium’s waste diversion rate or the number of guests who travel to the game by bike? Increasingly, they can. Over Jenkins’ seven-year period in Seattle, Safeco Field has achieved 86% of waste diverted from landfill through its “Strike Out the Landfill” campaign, sponsored by BASF. Through a waste campaign featuring star pitcher Felix Hernandez, the Mariners achieved the significant fan engagement necessary to ensure that waste is being properly sorted. Zeulner showed that when his team used a thorough GHG inventory, they found that 58% of their Scope III emissions  came from guests commuting to the arena. Zeulner’s team installed higher quality bike racks and encouraged fans to bike to the game, and nearly overnight the arena went from 20 to 100 bikes. They now they see an average of 250 per event. The sports industry has a unique opportunity and, increasingly, an obligation to its stakeholders and fans to show leadership in sustainability. In addition to the Seattle Mariners and the Portland Trailblazers, representatives from the New York Yankees, Miami Heat, NASCAR, Pocono Raceway, and AEG contributed their experiences and best practices on Friday that to show that cost savings and influence occur across the sports industry. They transcend specific teams and are applicable across the country. Frances Beinecke, President of the NRDC and closing keynote speaker for the conference, reminded all in attendance that the sports industry across the world relies on natural resources like open space and temperate weather, which can be taken for granted in professional stadiums and climate controlled arenas. The professional sports industry has the opportunity to be a force for scalable sustainability solutions as well as increased public understanding of environmental issues. It is time for the whole industry to follow the example set forth by these leaders and step up to the plate. For more information about the Wharton’s Initiative for Global Environmental Leadership, please click here. This article was reposted by Triple Pundit here. Scope III Emissions (per the GHG Protocol): Other indirect emissions, such as the extraction and production of purchased materials and fuels, transport-related activities in vehicles not owned or controlled by the reporting entity, electricity-related activities (e.g. T&D losses) not covered in Scope 2, outsourced activities, waste disposal, etc. This entry was posted in business sustainability, IGEL Conferences, reduce, social impact, students, sustainability in sports, Uncategorized, Wharton IGEL and tagged business, corporate sustainability, environment, Fall 2013, NRDC, Penn, students, sustainability, Wharton. Bookmark the permalink.